There’s action heating up a comfortable, cool, shady area at Pride — complete with tables, umbrellas, and chairs to better connect with friends and the community. 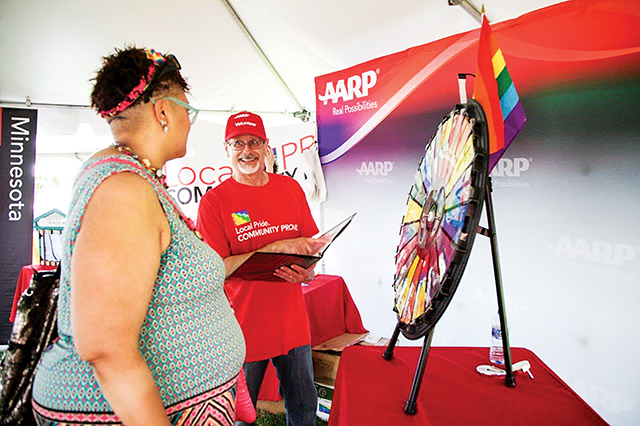 Boomer Town, now in its third year, is a dedicated space in the park for GLBTQ seniors. Inspired by Harry Hartigan, a Prime Timers volunteer and activist for diversity and inclusion for seniors, Boomer Town offers a more relaxing and accessible space for GLBTQ seniors. Resources and support in Boomer Town are intended specifically for these important members of our community, including information on volunteer opportunities, healthcare, community events, and more. It’s also a great place to network with other like-aged and like-minded community members. AARP Minnesota is the official sponsor of Boomer Town. They’re also the 2015 Corporate Champion of Pride Award winners, for their dedicated partnership in providing this important resource. Two other organizations key in the partnership efforts include Prime Timers MSP and Little Brothers-Friends of the Elderly. Special thanks to AARP Minnesota and partners for helping create this important pillar in the park.